When I was approached last Thursday 9 th of July to take part in an interview to talk about the consumption of possums for your program “The Project” I honestly thought that I was going to be part of a balanced and fair segment in which both sides of the story were going to be explored equally. I had a reporter and a camera man from your program visiting my wildlife shelter for a couple of hours and I felt very happy with the interview we had. 1. As a biologist specialized in Zoology, I tried to explain the conservation, sustainability and ecological long term implications of catching possums directly from the wild, killing them and offering them as a food source to an increasing human population. This is particularly dangerous when the possums come from an island, where ecosystems are exceptionally vulnerable and sensitive. I also talked about the many difficulties that our wildlife is already facing due to human interference, as well as the structure of brushtail possum’s populations, the cause of imbalance in wildlife species and ways in which this situation could be addressed. 2. As a Wildlife Shelter Operator for 15 years, I shared my experience about caring and rehabilitating orphaned, injured, sick and displaced native animals, so the members of the public could have a better understanding of our wildlife, possums in particular, from a point of view that most people don’t have access to. I thought this was a wonderful opportunity for our community to learn about many amazing and interesting characteristics that possums have. Many of us would be opposed to eating cats or dogs, because we are connected with them in many ways; for obvious reasons most people don’t have the chance to interact with possums like wildlife carers do, so I thought that this interview could offer that rare opportunity to share such a valuable new perspective about them. 3. As an environmental educator, I expressed the need to educate our community about the uniqueness and beauty of our native animals, and also about their fragility, their importance and their current condition. We all need to understand, appreciate, respect, take responsibility and connect with the unique creatures that share this land with us. Education about our wildlife and the environment that sustains us all is a key factor for the long term survival of all forms of life, including ours. I had seen The Project before and I thought that you were an impartial, objective and fair program, in which both sides of any story were presented. I had such respect for your program and because of that, I was very happy to take part in this segment. However, I was horrified, disappointed and deeply saddened when I saw that your program was a true ad for possum pies. I honestly didn’t know that you were advocates for wildlife consumption and business promoters. Many of us are wondering if the restaurant paid you for this ad, or the pies you ate at the end were enough payment to promote it. All the information you presented was turned against the possums in a very irresponsible and uninformed way. Journalists have a great responsibility because they can educate our community and shape ways of living, ways of thinking and ways of acting, and I don’t think you yet realise the implications for the possums and the wildlife in general of your program last Friday. – You said that “possums are in plague proportions that threatens farm land and other native species”. This comment is not only extremely ignorant but dangerous. Wildlife interactions are more complex than that and, and the threats usually go the other way around: humans to wildlife and not wildlife to humans. What is very shallow from your report, is never asking yourselves why populations of wildlife are unbalanced, and what is worse, implying that the solution to this “problem” is killing the possums. You need to be honest and admit that the real reason of this killing at the moment is not for environmental reasons but to make profit for a business. humans is sustainable in the long term? Australia has the highest rate of mammal extinction on the planet. All extinct or endangered animals in Australia were common not long ago, but many of them were labelled as a “plague” and look at the result. Do you realise the dangers of your comments? profit as the restaurant you are promoting is doing it today. You cannot compare the way of life of aborigines and ours regarding the relationship with nature, I think this is insulting for them. You took all the time to show one side of the story and from the entire interview you did with me, you aired only two sentences out of context. The voice of the possums, the voice of the wildlife, the voice of the environment, the voice of all wildlife carers that volunteer their lives to help wildlife in need, were silent in your report. I believe that true journalism needs to be fair. With your report you are influencing the community in one way and you are not giving people the opportunity to see the whole picture and make an informed decision or have an informed opinion about this critical issue. I honestly believe that you have done so much damage and you don’t even realise it yet. I would like to ask you to be professional enough to air the entire interview you did with me, and also contact the wildlife organisations we have in Victoria and ask their opinions, their experiences and their points of view about this issue. This is not a matter of opinions or ideas; for many creatures, this is a matter of life and death, this is a matter of conservation and education, and this is a matter of damaging or protecting the very complex web of life which we are all a part of. 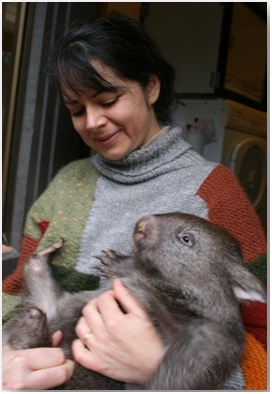 Adriana Simmonds is a Colombian Biologist who fell in love with Australia and its amazing creatures. She has always been an environmental educator trying to share my passion for animals and the environment with people of all ages and backgrounds. During the past 11 years she’s been running a wildlife shelter, where she has had the privilege of taking care of countless orphaned, injured, sick and displaced native animals. I am distressed beyond words by your piece on Possums as reported by the wildlife carer you filmed. Waleed – you were my favourite free-to-air commentator. I thought you still had a conscience. I was wrong. I am truly disappointed in The Project. I had great admiration for your show, but that has gone. It will never be viewed in my home again. 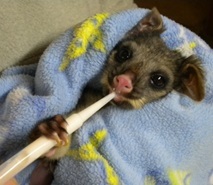 Long live the possums, and other precious native wildlife. Yes I agree, I too saw the segment and was thoroughly disappointed by the attitudes and sick jokes of the most of the presenters. The woman who owned the restaurant had no guilt about cooking and serving our Australian wildlife, that is under threat from food and habitat loss. Profit again is the motivator. We have no need to eat animal products to be kind and healthy. I did not see this programme but as a possum carer I am appalled at the ignorance and stupidity I encounter on a regular basis on dealing with the public with regard to possums. The media should know better. Possums are a protected wildlife species. Catching, killing and then cooking them is braking the law. These restaurant people should be reported and prosecuted. Shame on you! This reporting shows up Australians as real barbarians. You take your life in your hands if you eat possum pie prepared in insanity conditions in someone’s back yard. Anyway possums are a protected species so killing them is illegal. It may surprise Channel 10 viewers to hear that overseas tourists love our possums. Many tourists from all over the world come to St Kilda to view the possums in one of the many parks. I wont say where in case some of the Channel 10 audience come and harm the animals. Next we will be getting ads for recipes for dog and cat meat. Unfortunately the possum meat that restaurants use are legally harvested and processed in a factory before being sold. This occurs in Tasmania. I have seen graphic footage of how these poor little animals are treated by factory workers when they think they are unobserved and it is sickening. But hey…. government allows it. That’s where we need to be pointing the finger first. I sometimes watch ‘The Project’ and would have been very disappointed to see and hear our wildlife let down to the point of exploitation as a cheap form of entertainment. It seems that once again education is the answer but there are none so deaf as those who will not hear or as blind as those who will not see. I would have expected better.